As Destini went through several weeks of rigorous practice, she was eventually presented with a dilemma. Right before the approaching date of her dance recital, Destini was pulled to the side with bad news from her instructor. She told Destini, "Ballet dancers must be neat. Ballet dancers must look clean. Those braids must go. They are too unruly to fit neatly in a bun." But Destini loved her locs and knew that they were an extension of her. Telling her that her hair was "unruly" and "had to go" made no sense to her. Unfortunately, the instructor did not share Destini's sentiment, further challenging that if she wanted to be a dancer, she must "look like" one. As you can imagine, hearing this from her instructor was discouraging. After sharing her feelings with her mother, Destini's mom made it her business to remove Destini's worry. In fact, she met the ballet instructor's resistance by telling everyone about how she treated her daughter. Soon enough, the word got around to local newspapers and other media, eventually being shared on TV! Once the news about Destini's encounter with her instructor traveled all over town, the instructor suddenly had a change of heart. And as poetic justice would have it, Destini was able to perform at her dance recital without changing one thing about herself! The gem I discovered in reading I Just Kept Spinning is the underlying lesson about grace. Destini wanted to be just as graceful as the dancers she had encountered. 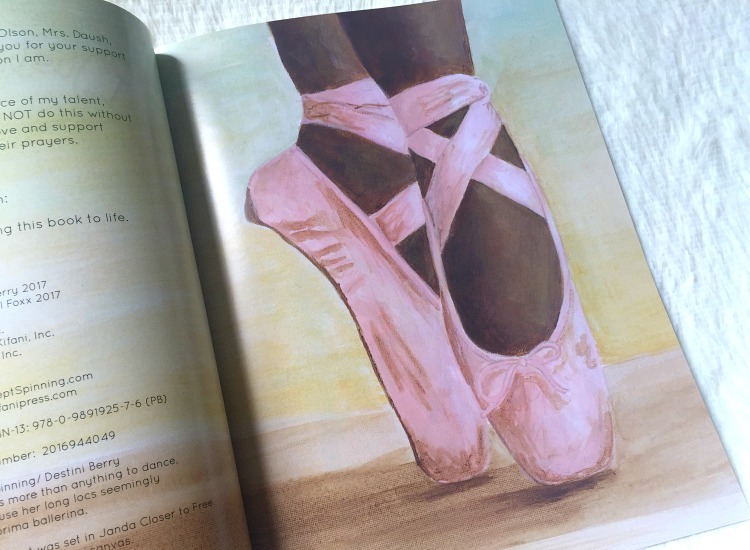 And while her journey to becoming a ballerina was met with opposition, she did not quit. Destini could not change her instructor's mind about her hair, nor could she convince her that she belonged in that space just like the rest of the girls. But she was able to share her feelings with her mother, who in turn spoke up for her. Destini didn't complain to the instructor, nor was she outwardly angry or negative after hearing her words. But by talking to her mother and using her voice to share her experience, she was still able to dance at the recital AND wear her hair just the same. As confusing as the instructor's remarks had to have been for Destini, she remained hopeful and showed grace in the end. Though this book is ideal for children ages 5-8, my 12-year-old daughter really enjoyed reading this story based on Destini Berry's own personal experience. She admired Destini's determination while I applauded her mother's courage to speak up about the discrimination her daughter faced. In light of our lessons learned, we both smiled at each other when my 3-year-old son marveled at the beautifully rich illustrations by April Foxx, noting that Destini had "very pretty hair." Needless to say, I Just Kept Spinning is a welcomed addition to our children's bookshelf. Thank you so much to Destini Berry and sisters April + Ashley Foxx of Kifani Press for sharing this enchanting read with my family! To pre-order a copy for yourself, your family, and/or the children in your life (especially the determined little girls with hair full of personality), be sure to click the link here. If you order by Friday, September 15, you can receive 15% off by using the code DYS15 at checkout. 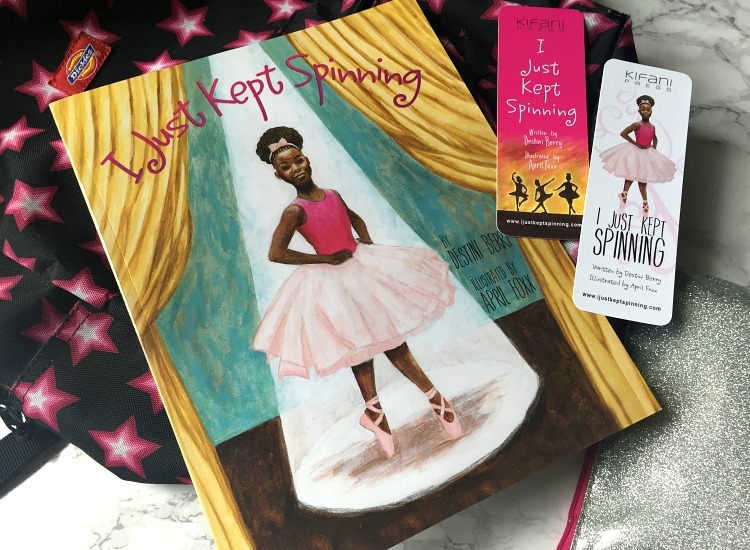 Will you be reading "I Just Kept Spinning" with your children?